It’s been an interesting year here goal-wise for the Frugal Farmer family. We did well in some areas, crappy in others. In my true over-analyzation style, I’ve been spending the last couple of weeks assessing our 2014 behaviors, analyzing what we did right, what we did wrong, and working to form a more successful plan for 2015. I’ve also been praying LOTS to God for wisdom in how we can do better. I would say that, by and large, our biggest problem in 2014 is that we simply got too comfy with what we’ve already done. We’re spending less, and spend-tracking, more than we did in 2013. We worked more on self-sufficiency in 2014 than we did in 2013. While that’s all well and good, the enemy of the best is “good enough”. We don’t want good enough, we want “best”, and in that way, we really failed ourselves in 2014. I’ve spent a good part of the last two weeks praying and seeking God for advice about how we can do “best” in 2015, and He’s given me (as is His custom 🙂 ), some AWESOME tips. I won’t be sharing a whole lot today about what those tips are, as I really want the results to speak for themselves. But I will share the bigger pictures goals that we’ve set in place for 2015. We have one and only one goal for 2015 regarding our finances, and that is that we be “gazelle intense” about reaching debt freedom. I’ve commented in other posts about how we just couldn’t get motivated by Dave Ramsey and his gazelle intense method. As I sat in prayer these last couple of weeks, the Lord revealed to me that the reason we haven’t been motivated by the Gazelle Intense plan is because we haven’t truly wanted to be gazelle intense. Ouch. But true. So, using the instructions He has laid out for us, we begin today on our journey through gazelle intensity. The plan involves seeking Him first every step of the way for every dime that comes into this household. I will be giving detailed reports on what that means each month, and how we do. Our goal in homesteading this year is simply to kick it up big time regarding growing and preserving our own food. Although we did plant and preserve more this year than we did last year, we were nowhere near our goal of providing the veggies we need for the entire year. Some may say I’m a bit of a conspiracy theorist, but I am gravely concerned for the financial state of America, and part of that concern is due to rising food costs. Part of the way we keep our grocery bill so very low is to memorize food prices so that we know when we’re getting a good deal, and when we’re not. As I’ve shopped these last several months, I’ve noticed several key necessity food items going up, up, up in price. This is not a good indicator of stability for the future of an America that is increasing in consumer debt and government debt on a daily basis. As such, our goal will be, as Rick says often, to “plant the hell” out of our garden. For instance, we tried potatoes for the first time last year, planting 12 plants which yielded about a pound of potatoes each. Potato plants have the capability to produce 5 pounds of potatoes easily, so we’ll work to increase our yield by planting many more potato plants, and by adding fertilizer and putting in place some other tips we gleaned from a gardening expert friend last fall. So, there you have it: two simple goals for 2015. However, both are goals that will take a huge commitment of our thoughts and time. What are your 2015 goals? Was there an area you failed in last year that’s laying heavy on your heart? I love the concept of “gazelle intensity.” I think it’s awesome that you’re applying that to your goals this year–I’m going to do the same! For Mr. FW and me, if we truly commit to a goal together (like our financial independence/homestead goal), we almost always achieve it. The goals I see us fall short on are usually the ones where we’re not both completely bought in. All that to say, since you and Rick are so aligned in your dreams, you’re going to rock it in 2015! Here’s to a fantastic year! I love this! I agree – the goals that are achieved are often the ones where both partners are 100% on the same page. Definitely, Brooke. It truly makes a difference! Thanks so much, Mrs. FW, and thanks for being such an inspiration to us with your own colossally frugal ways, friend! Pay off all the debt and yield all the potatoes! I like it! Now that your heart is behind it, you’ll do great. I’m still evaluating my 2015 goals. I may have gone too intense with my debt in 2014, allowing other priorities to fall off my radar, specifically my health and retirement goals. Hopefully, I can find some sort of balance in 2015. Thanks, Kate! Interesting that you feel you went too intense with debt payoff: it’s hard to find that balance, isn’t it? I love the simplicity of these two goals (you could wed the first one to J. Money’s “Challenge Everything” too). It’s easier to do one thing than to multitask — so if “pay down debt” is your mantra, rather than a ton of smaller goals, I think you’ll make a lot of progress this year. Looking forward to it! Thanks so much, C. We’re looking forward to it as well. It’ll be SO much easier with just that one thing to focus on. Good luck! I know you guys can get gazelle intense this year and accomplish your goal! We are shifting gears and no to building wealth, out big goal is to kick our retirement saving up to at least 15%. Brian, that’s awesome! I hope you’ll continue to share your debt payoff story when you get the chance too. It’s so inspiring! I think that it is so great that you have the capability of growing a lot of your own food. That way you know what your children are eating and that is priceless. Prices for food is getting ridiculous. I wish you the best with your 2015 goals and I look forward to following your story. Thanks, Petrish! Yes, it really is comforting pulling food out of the garden, knowing that we are eating truly healthy food. Best of luck to you too as you work on your goals for this year – you can do it! Good luck! I am looking forward to gleaning some gardening tips from you this year. We are planning on starting a garden for the first time this year. Good for you guys for staring a garden, Brooke!! I’ve got several posts on that in the homesteading and frugal foods sections of the blog, including a great one on gardening basics! Yeah, I hear you on the gazelle intense. You’ve really got to be ready to do it in order for it to work. Hey the gazelle intensity would be enough for me! So I think it’s great you are laser focused on only a couple of goals! I need you to fly out here so you can show me how to plant even just a tiny garden. 🙂 Good luck with you goals this year! Exactly, JD. What is the choice? I feel stronger than ever this year that dumping debt is vitally important for everyone. Best of luck to you, I know you can reach your goals, my friend! I was being sarcastic….sorry. Either stay in debt or dig out is it. Isn’t it awful when you pray to God and He gives you an honest answer but not one you wanted. I usually get something like that when I haven’t fully committed to something (at least as much as I think I am). 2015 will be all about bringing my vision of financial planning to the masses. I am literally gazelle focused on this because it’s so important for it to be available and the only thing standing in the way of that happening is my energy and drive. Wish me luck! LOL, yeah, it is definitely humbling, that’s for sure. 🙂 I love your goal, Shannon. There is such a need for financial education out there, and you are just the one to spread the knowledge. I like the “less goals” approach. I think it’s impossible to be laser-focused when you have fifteen goals in your face. Go potatoes! I think we have tried to do the “15 goals” thing this year, Joe, and it’s really come back to bite us in the tail. Looking very much forward to a laser-focused year. Great concepts! I can’t wait to hear your updates in 2015! Sounds like great goals! I’d love to hear the tips from your gardening expert friend. Will you be publishing posts on tips for gardening success? That’s an area I’d really like to get better at. Good luck on your 2015 goals! Hi Dee! I’ve got several posts on gardening tips in the archives here under Frugal Food and Homesteading. Check them out- they rock! I love how simple these goals are! I also love that you have two categories. Homesteading is such a huge task in itself, but it’s nice that frugality and homesteading go hand-in-hand so easily. A huge yay for seeking first His kingdom. I’d encourage you, if you haven’t already, to create some measurable goals for achieving that gazelle intensity. Perhaps a specific debt-smashing goal each month or something. I’m sure you’ve done that, just a reminder. Great site. Sounds like you have your priorities straight. It says that when we seek Him first, all these things will be added unto us. I’m sure God will honor your commitment and efforts. God bless in the New Year, Laurie! I can’t wait to hear your potato tips! We planted some in the ground and some in potato ‘buckets’ but are thinking of doing the ‘build as they grow’ method this year. I asked my hubby last night what we could do to get gazelle intense. We are looking for stuff to sell but I’m thinking we are pretty gazelle like for the most part;0) It was really fun for us to sit as a family writing our goals and sharing them. One goal in common for this year is to take a trip to Canada! Doesn’t sound real gazelle like does it? Lol! I’m all for having a little fun while the kids are still under our roof! LOL, I hear you, Jayleen. It’s tough to find that balance of having some fun and yet paying off debt. We haven’t talked about any type of a summer vaca yet, but we’re well overdue for one, that’s for sure. It’s been 6 years!!!! I think you’re going to do great. Kill that debt and grow those luscious sun-soaked healthy foods! I’d love to talk Mr. WW into getting chickens to help weed (by way of a run around our fenced in garden) and then use that energy they glean from keeping the weeds from getting in our garden to produce wonderful eggs for us. I think I need to pray for like-mindedness. I think that’s a terrific idea, about praying for like-mindedness, Mrs. WW! You’ll have to keep me updated on how that turns out. I think we’ll likely get chickens one day soon too, but we’ll see. Yeah, that grocery budget really showed me that we can do much better if we put our minds to it. I think your idea of breaking it down month by month is a good one, Joyce. Sometimes when we look too far ahead we can get lax in our goals, focusing on all of the time we have left, and then before you know it, the year is gone! I like the concept of gazelle intensity. “Give no sleep to your eyes, nor slumber to your eyelids. 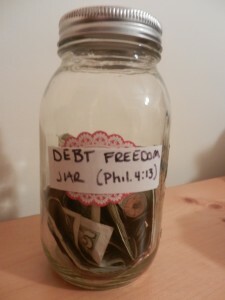 Deliver yourself like a gazelle from the hand of the hunter, and like a bird from the hand of the fowler.” I will start today to get out of debt. You go, Jayson. I know you can do it! Sounds like 2015 is going to be awesome for you! I can very much relate the whole gazelle intensity thing. We weren’t really in a position to do that with our student loans last year, but I’m putting the focus on them this year, otherwise I know we’ll just get complacent. Best of luck! So excited for you, Erin, that you are going to kick those loans to the curb this year too – you can do it, my friend! I love that your goals are simple, but all encompassing. I look forward to cheering you on in 2015! Best wishes! Thanks so much, Chela. Best to you too in 2015! I’m right with you on the debt this year Laurie. 2015 will be the year of the debt repayment. I’m sure you will do great. Sounds like you have the focus and drive to make headway on your debt this year. We got this! Yay! Glad you guys are kicking your debt to the curb this year too – what a fun celebration it will be for both of our families, Liz! FWIW I know that when we were deep in debt payoff mode, gazelle-like intensity was the only way that we could make any real progress towards our goals. It was all-in or nothing. I love your spirit and know that you guys can get there! Happy New Year, Laurie! These goals might seem simple, but they are indeed really demanding and they require quite some dedication. But I am sure you have all that it takes to make them happen! And prices are going up everywhere, I also started to notice that since we’re tracking all our expenses – and one of the reasons we’re planning to start growing our own food starting this year. Thanks so much, C! SO glad to hear you guys are going to start growing your own food. I’m quite sure you’ll find it a real blessing! I can honestly say that having the “gazelle intensity” gets big results! I two have just two goals for 2015 so you’ll learn of them next week. I know you and your family can get these goals accomplished and I’m rooting for you 100%. Thanks, John. I know we’ll both kick it this year! I’m pretty new to the gazelle intensity concept but my initial reaction was not for Tanya. But … in all honesty, it’s me being resistant and/or scared. I need to think about this some more and where I might want to apply with my life because I can see how it would make a big impact. My Mom went a little overboard with her garden last year and her freezer is about stuffed to the limit. She does preserve some food, but she tends to freeze more and they have one of those big freezers too! But everything does taste so much better than store bought. Interesting, Tanya! That’s what I found too about “gazelle intense” at first, but I think it was more resistant than scared. I love that your mom does so much freezing. I love pulling our frozen veggies out of the deep freezer. They are SO yummy! Whoa, that hit me hard. In a good way! Mainly, I need to be praying more to the Lord regarding my finances and where he wants me to put my money. I haven’t been doing that at all.